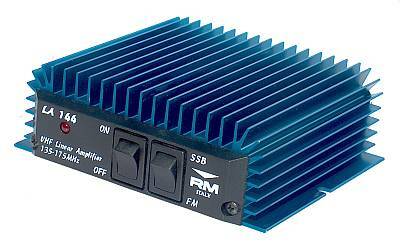 The LA-250 is a 200W 140-150MHz amplifier, at 1 to 20W input (13.6V 30A). It uses 4 Mitsubishi RD70 Mosfets mounted on a copper heat spreader (200x60x3mm). It is available in two versions one with and one without top mounted fans. There is an external PTT input but it can be used also without due to the built-in HF-VOX. 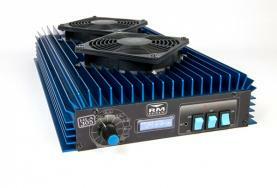 The front panel features an LCD display which shows input power, output power, heat sink temp and output VSWR. There is the ability to change the intensity of the backlight. The CPU keeps an eye on input power, temperature and VSWR and will if necessary disable the amplifier from transmitting if there is fault. Any errors will also be recorded and will be available for later recall for diagnostic purposes by either the manufacturer or his distributors. Weight is approximately 4kg. 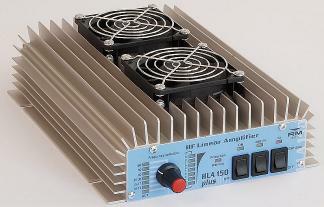 The HLA-350 operates from 1.8 - 30 MHz and its output power is 250W, with an input power of 1-10 Watt. There are 6 filters built-in to suppress harmonics, which are switched automatically but can also be switched manually for special operating conditions. 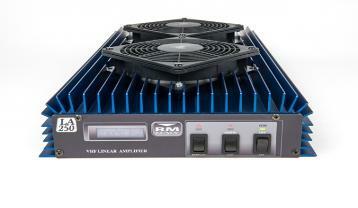 At the front panel there is a switchable input attenuator as well as a LC-display which can show input power, output power, heat sink temperature or output SWR. The intensity of the background light is adjustable. The CPU monitors input power, temperature and VSWR. Any error status are saved so that the manufacturer or authorised reseller can read them out for diagnose purposes. The PA has a PTT input (use for SSB recommended), but also a built-in HF-VOX. For optimal heat distribution the PA transistors are mounted on a large copper heat spreader (200x60x3mm). The HLA-350 has an oversized heatsink and therefore remains cool during operation. For operation the PA requires 13.5V at max. 34A, dimensions are about 240x420x70mm and weight 4,3 Kg. The model HLA-350V comes with 2 additional temperature-controlled fans and thus has a total height of 80mm instead of 70mm. The DC cable is removable.